About this time last year I was approached by a trucker who requested that we run his father as our Rig of The Month for May, as a surprise for his birthday. The driver did such a great job writing the article for his father that I asked him if he would like to write more articles for the magazine. That driver, our regular readers will recognise as Greg Evasiuk. 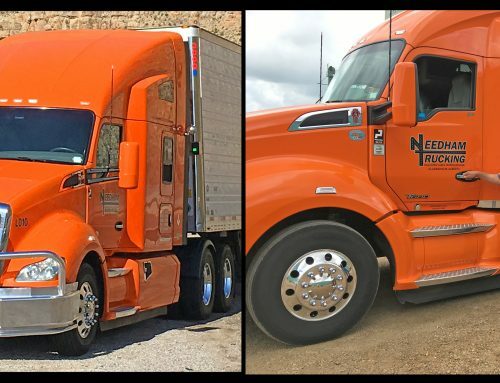 Greg is such a good story teller that we asked him to be this month’s Rig of the Month driver. This is his story. As far back as anyone can recall I’ve been fascinated with trucks. 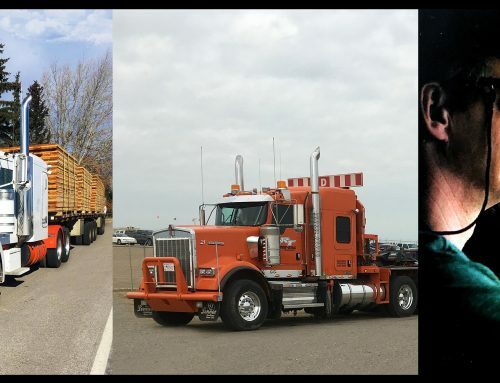 Truck was one of my earliest words although it may have sounded suspiciously like a certain four letter word with the same ending… For avid Pro-Trucker readers this is the continuation of last year’s May issue which featured my dad Rick. A read of that story would explain some of how I ended up in the industry but I’ll spare you the look through the archives and give you the reader’s digest version (to you millennials that’s the condensed version). My grandpa Nick Evasiuk started a company in Mayerthorpe that became Whitecourt Transport in Whitecourt. My dad tried to become a gym teacher, got hit by a cab, rejoined the family business, left it for a couple years to Kelowna and came back to eventually be part owner of the company. So I entered that story while mom and dad were in Kelowna. I was born in Kelowna General Hospital at 8:35 am March 20, 1976 the first of two boys and the only one in our family born outside of Alberta. Mom and dad left Kelowna the next month to go back to work in Whitecourt. Somewhere around the age of two I had what was my first and only real destructive truck crash. My dad had built a really nice W900… model which was displayed on the bar in the basement. It was apparently my wish to drive this truck and one afternoon I scaled the barstools to do just that. Unfortunately for the Kenworth, my skills were shaky at best and the truck ended up on the floor in nearly as many pieces as it initially came in! Thankfully for me my dad’s an understanding guy and knew that wanting to drive trucks was a sickness I couldn’t help. Throughout my childhood I went out trucking with dad whenever I could. He says I wouldn’t sleep either, get up at 4 in the morning go load lumber and go all the way to Lloydminster unload and get home at 6:30. I’d just sit there on the doghouse of that old Freightliner and chatter away, my dad’s still waiting for me to stop talking! I think that’s where I started developing an eye and a memory for truck types and specs too. Asking questions about all those trucks made me feel grown up even more so when I could remember the answers. Seriously to this day I can give a darn near perfect run down of the trucks we had in the fleet from the early ‘80s on, I’m sure all of that info will come in useful one day! My brother and I started working at the shop doing odd jobs at around 8-10 years old. We would sweep the floors, clean out and wash trucks and our favorite, cleaning the yard. This wasn’t the favorite job for me until we were allowed to use dad’s pick-up to put the garbage in. For me that was the coolest even though it was only slow rolling around the yard, it was driving! By the time I was thirteen I would drive the pickup down the road to the dump by myself and get rid of the garbage when it was “full”. Some days it was four or five pretty light loads. Around the same time Uncle Phillip told me to go out and back a van into the dock so we could strip it. Now I’d seen it done hundreds of times but never had any instruction on how to do it, 45 minutes later I walked back in triumphantly! While I fully expected to get praise for not having hit anything and being 13 driving a tractor trailer, the response I got was “maybe you can be a little quicker next time, we pay you by the hour.” Well I can do that. An hour later I got asked to go and pull a different trailer out of the door and I was going to show him quicker! I backed the tractor under, hooked the lines, spun the legs up a bit and pulled out. My second lesson of the day turned out to be why you do a tug test! Thankfully one of the older guys took some pity on me and saved me a long lecture by helping me hook back up and put on some new glad hands. It must have to do with the way everyone in the family learned but back then it was always baptism by fire. I got my license on the day of my birthday in 1992 and I was doing local deliveries in a 5 ton after school weeks later. Within a week of starting fulltime for summer I found myself in Edmonton in an FL70 with a 26ft deck picking up steel. No one ever asked can you do this, do you know how to??? It was always we need you to go to____ you have to be there by 1 so you better get moving! That was my after school and summer job on and off throughout high school and quite honestly I loved it. I learned a lot of really good lessons and got to work with my brother and friends and make money! But much like my dad when I was done high school I was convinced my future was not in trucking. Off to Edmonton I went on an ill-fated mission to become a partsman. Three short months later, upon realizing that wasn’t my calling, I went back to Whitecourt to work the remainder of the winter on the pipeline. I enjoyed that but needed something to keep the cash coming when break-up came so I started working for Millar Western in the shake mill. That was the job that inadvertently turned me back to trucking. A posting came up for temporary relief as a scale attendant for log haul and I managed to get it. I loved that job, they would send me out to do safety checks in the bush, fly me around to check out the haul and the best part, I got to go on ride alongs. That was to me the golden age of log truckin’, in the Whitecourt area anyways. They affectionately called the haul the Millar 500 and it was aptly named. Everyone was payed percentage and only the best drivers got to haul off L1 and the rest would go to the easy haul either in Fort Assiniboine or the Chickadee. The haul was full of characters with nicknames like “Hollywood” and real names like Ted Speed and Danny Fast. It was a bona fide race from start-up Sunday morning until the last load was loaded on Friday morning. All week long the trucks would have to try hold their spot in line while others tried to scoop them. Scooping is passing and being that you were speed monitored by tachograph for the highway, it could only happen under certain circumstances. Most times it would happen when one trucker was much faster on the bush road or at wrapping up that driver would then just kind of “chase” the other truck out of the bush. Eventually the slower driver would either make a mistake or just ask the faster truck to go by. Scoop! After a few rides that I went on for the job I was hooked. I started to make friends with some of the drivers and go out with them to the bush for loads when I was off work. One such friend I made was Geoff or Kiwi as he’s known to most. Anyways my first trip to the bush with him started at the fuel pumps while he and his cross shift Glen were switching out. I grabbed my gear and was sitting on the swamp side when I heard that kiwi drawl say, “you’re in the wrong seat there young fella”. I still remember rolling out of town that first time, I felt like I had kinda made it… of course when we hit the bush road Geoff took over driving because I still had a lot to learn. As we wound back towards the block descending down off the goose ridge and into the valley he asked a few of the loaded trucks whether or not we would need chains. I noticed almost all of them wore at least one set but they all said “naw your good Kiwi you got big power”. When we dropped off down the last bench to the loader I seriously wondered if that 500 Cat was in fact big enough power. Well we got this really nice load of long spruce which even with a 40T winter load was barely above the knuckle on the stakes and the pole was stretched right out. Now for those that haven’t hauled wood, a load like that is an absolute dream to pull because the center of gravity is low and the pole trailer rides so much smoother the more it’s stretched. I’m not sure if any of that entered into the no chains decision or not but Geoff headed for the bottom of that ridge railing around the corners to attack the first climb. To my amazement he grabbed a couple and went over the top of the first step without even wiping his feet. Hmmm, I thought we do have big power! A couple little rollers and corners and we’re pulling up the second bench. The truck waiting in the pullout says “holy s__t! No chains that thing must be working good!” One look over at Geoff and he’s grinning ear to ear with pride as we head up the last pull. Sometimes the trucking gods will bring you back to earth for being too smug about your skill and your power. That was the lesson I learned next as I felt the truck hop once then twice before stopping. There we were, valley down to my right, bank on the left, ten feet shy of the hilltop and spun out! Geoff calmly says he’ll hop out and throw the chains on and I took a look down towards where we came from in the valley. As I turned back towards the front of the truck I was curious why Geoff was standing there in front of the truck with chains in hand… not good! He was there because myself and the truck were going backwards down the hill! Thank god the cab in a ’96 Western Star is narrow, I slid across the ¾ seat inadvertently grabbing the wheel and I hammered the brake pedal. Probably the accidental wheel grab that saved me because it stuffed the tops into the bank on the driver’s side. Needless to say when Geoff open the door and said, “Good thinking there young fella!” I took full credit. I went on to work for Kiwi in the winter for 4-5 winters and worked for Whitecourt Transport in the summer. Somewhere in there I managed to fit in Management Studies at Grant MacEwan University, thankfully they offer a flexible schedule allowing me to fit courses in around work and in the summer. In 2001 I partnered with Kiwi and some of my family in Progressive Forest Contracting, a log load and haul company. This was where I learned how to haul equipment, load logs, sand roads, run a tow tractor, run wheel loader and winch tractor. 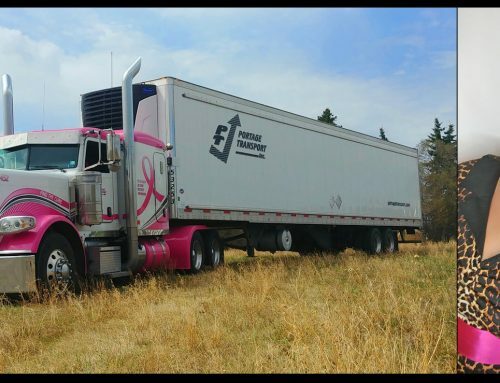 At the end of the summer in 2003 I was approached to come back to Whitecourt Transport full time to help with the growing need for service to the Oilfield. It would be a more structured job with set weekends off and generally no night shifts. The other plus being that we worked together with Progressive anyway so I could go over and help out if need be. My favorite part of going back was getting to work with my dad again. He had passed on being the maintenance manager to my cousin’s husband and was driving again hauling sawdust to the rigs as well. Later on my brother Brett re-joined the company as well which made it a bit like old times. 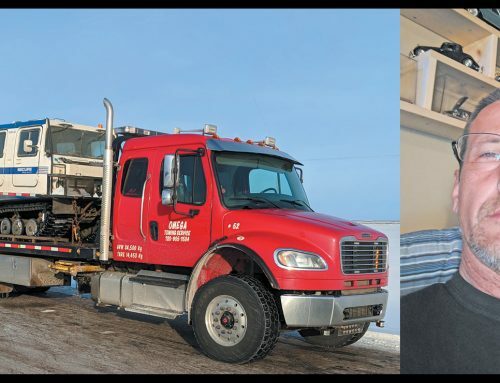 We were moving equipment for a pipeline company back and forth across the Berland River and throughout the back country north of Hinton for about a month. Brett had been out there with the tri-drive moving gear for a day or so before I showed up with my tandem Pete and lowboy. The first move we made at night was a couple of 330 Cat excavators. Anyways he already had a set of chains on when I got there and I didn’t figure I needed them yet because I had just put a new set of drive tires on. With my brother leading the way because he had been to the lease before, we took off across the Berland from the ANC Rd. I stopped to water down the snow and check my load saying I’d catch up. I turned onto the KT Rd. called “empty” on the radio and started grabbing gears. Knowing that the road was clear ahead I railed past the chain-up area where I caught a glimpse of Brett’s truck and him out monkeying with the chains. As I kept going he got on the radio and said “aren’t you gonna stop and put another set on? I barely made it up that first hill last time!” Hmmm, that was information I wished I had before I blew by the last turnout before the hill. By the time I finished that thought I had rounded the corner and realised I was committed. It’s a long steep climb and it hadn’t been scraped or graveled. The only rock was what had been dug up by other trucks chewing with their chains. Well I hit it in 6th wide open and promptly shifted to 4th and then second. Generally I’m a little nervous on a big hill barefoot in second gear and this was no exception but I didn’t kick once. When stopped to check our loads at the end of the Jim Clark Rd. my brother nearly fell over. “You were barefoot? I almost spun out with 2 sets and I have a tri drive? !” he gasped. “Well I’ve been at this game a bit longer than you. One day maybe you’ll be this good.” I gloated. The truth is I didn’t know why my truck had such good traction, heck we worked together up there for another 4 or 5 days before we went home and I never had to put a single chain on. I figured it out back at the shop when Shane asked if I had a low tire. “Not sure” I replied and we got out the gauge to check it… 60PSI. Check the one beside it because it looks the same… 60PSI. We went around and found that all 8 drives were the exact same! Turns out that someone had interrupted the Nitrogen fill while they were dropped and nobody remembered to resume it. I let that be my little secret for some time, actually sorry Brett if you’re hearing it here first! In 2010 I decided to break away from the family business and go out on my own. For the first time I bought my own truck, a 2002 Western Star 4900 tri drive with the 575 Detroit and a tridem pole trailer. My first day out with it was memorable to say the least. I turned around in the block, the loader picked the trailer up off the truck and honked for me to stop. As I have done a thousand times before I went back to close the pintle and tie up my lines but I needed to give the pole a little help to get the ring to drop down onto the hitch. Now I’m not sure if the loaderman moved the stick or what but just about as soon as I grabbed the pole I was looking down at my leg on one side of the pole and my foot on the other! The loader operator picked it up pretty quick but the damage had been done. At first I thought that I might have just dislocated it so I tried to push the bump on the side of my leg back in…ouch! I fell back to the ground and the operator got to me at the same time and said I should stay down because he heard it snap from inside the loader. Definitely not the way you want your first day in business to go! I was lucky however on two fronts; first I already had a plate in that ankle which according to the surgeon is the only reason I didn’t lose my foot, second my friend Brent knew someone who was in need of a job hauling logs. So while I was heading off to Edmonton to have my leg reconstructed my dad helped me to hire my first driver. Before that first winter was over I got my cast off and bought another truck and trailer for myself. 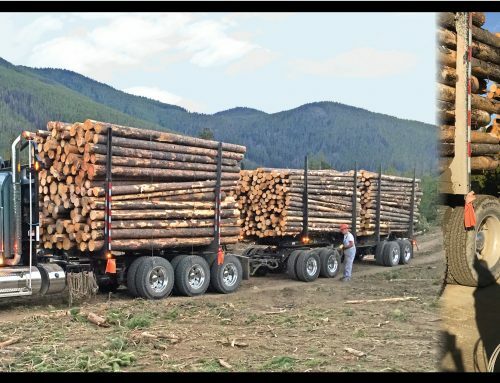 I spent a few years in logging and at one point I had five trucks but it was a tough go. Drivers were at a premium because of the boom in the oil patch and some of those that were left weren’t fit to drive a body job! Don’t get me wrong I had some good ones who really helped me out but they were the minority. After a while I got rid of all my logging stuff and went to work in the patch. I did a little of everything there including sales and dispatch. All the while I kept a truck so if I ever wanted to I could get back to driving which is exactly what I did when things started to go south in the oilfield. I bounced around with my truck hauling sand, mats and equipment. Then I leased on with Continental and ran north to Yellowknife for a while which was relaxing and when the ice started to melt I went over to Triton. My time there was short but I really enjoyed it. It was my first time running south and Terry and the guys made me feel right at home. Without all the help I’d probably still be sitting in some southern jailhouse for running the wrong route with wrong permits! Now that I’m off the road and selling I look back and think what a great adventure this industry can be. While the road definitely hasn’t been easy, those are the times that make for the best stories. The tough times are also what shows you who’s really there for you. Through thick and thin that’s been Karen, my wife. Since we met in 2004 she has helped me immeasurably to become the person I want to be. I’ve been working on writing a piece about the woman beside the man because I know she deserves more recognition than I could cover here. She’s given me two amazing kids and I love her more than I can express. My parents have also always been there for me, I think my love and appreciation for them shows through in my dad’s Rig of the Month article. Beyond that there are just too many people to name but I’m sure over time with the stories I’m able to share I’ll be able to thank them too! My dad is the custodian of my last ride you see here. A 2016 KW W900 with a 550 Cummins.